Millions of Americans are set to celebrate the Fourth of July with as much fervor and as many fireworks as the weather will allow. Picnics have been planned, barbeques will be lit and the beaches will be swamped with red, white and blue for the country’s Independence Day. AAA, one of the nation’s largest travel agencies, projects 42.3 million Americans will hit the road, traveling 50 miles or more from home between July 3 and July 8 for all the festivities. Last year, when the holiday fell on a Monday, 40.3 million people traveled. But before you think it’s a big increase, note that AAA’s economists changed how they estimated the number of travelers: They used a six-day period this year compared to five last year. The typical traveler will spend $749 over six days, down from $807 over five days last year, according to an online survey of 344 people conducted for AAA. Another look at the holiday, by Visa Inc., shows that all Americans – whether traveling or not – will spend an average of $191 on July 4th activities, down from $216 last year. Visa surveyed 1,012 people by telephone. The overwhelming majority of Independence Day travelers plan to drive: 35.5 million people or 84% of travelers according to AAA. As they do, they’ll get a break at the pump. Lower gas prices, at $3.33 a gallon nationwide compared with $3.55 a year ago, are a factor in the longer drives. “What the survey indicates is that Americans have an appetite for travel…,” Cynthia Brough, a spokeswoman for the American Automobile Association, said. Midwesterners will spend the most to celebrate the holiday, laying out an average of $211, while those in the Northeast will spending $40 less, the Visa survey found. According to Jason Alderman, senior director of global financial education at Visa, the holiday is bigger in Midwestern cities and towns, while Northeastern cities have more concentrated gatherings and firework displays. Temperatures across the nation are expected to reach the high 90s Fahrenheit (32 Celsius) over the next several days, according to AccuWeather.com. More than 1.4 million people from Illinois to Virginia remained without power Tuesday after the weekend’s violent storms, and forecasts indicate that there’s little hope for any reprieve from Mother Nature. Power companies said that the heat wave will keep some customers without power for the rest of the week, unable to turn on their air conditioners, surf the web or even turn on the lights. “This is the worst outage we’ve ever had,” said Jeri Matheny, spokeswoman for Appalachia Power, which serves most of southern West Virginia, to CNN. The storms have also brought on heavy rain or desperately dry conditions which will likely stay through the 4th of July, causing fireworks to be cancelled pre-emptively in numerous areas. The storms crossed the Eastern United States with heavy rain, hail and winds reaching 80 miles per hour starting Friday night, leaving more than 3 million homes and businesses without the power, according to a federal energy report. The storms also claimed at least 22 lives, mostly from falling trees and branches across the Midwest and Mid-Atlantic states. Ken Mallette, executive director of the Maryland Emergency Management Agency, told CNN that the damage compared to Hurricane Irene’s visit last year. “We got a hurricane punch without a hurricane warning,” he said. Independence Day celebrations were cancelled across Maryland, including ones schedule in Kensington, Germantown, Rockville and Gaithersburg, officials said. Summer camps have also been cancelled and residents are flocking to libraries, malls pools and anywhere else that might have power – and air conditioning – to keep cool. “If you need to charge your phone or you need Internet or anything, you show up here and it’s literally a madhouse,” Jacqueline Hirsch told CNN affiliate WJLA-TV. The Bethesda, Maryland, resident ran to the local library, only to find hundreds of others with the same idea. 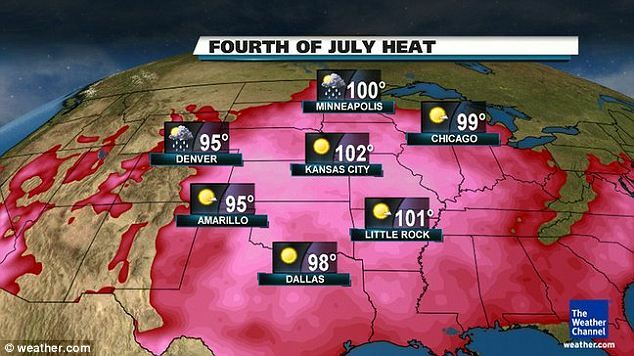 The National Weather Service issued extreme heat warnings were Tuesday for portions of Illinois, Indiana, Missouri, Kentucky, Ohio and Michigan, saying those areas would be hit with temperatures near or above triple digits on the 4th. Similar warnings were already in place for a handful of states, including parts of Nebraska, South Dakota, Wisconsin, Minnesota and Iowa. American Electric Power Co Inc of Ohio said Tuesday morning that crews were working to restore power to 357,000 customers in Virginia and West Virginia; 298,000 in Ohio; 32,000 in Indiana; and 14,000 in Kentucky. FirstEnergy Corp of Ohio said it had 216,000 customers out in its five-state service area of Ohio, Pennsylvania, West Virginia, Maryland and New Jersey. That was down from about the initial 566,000 affected by the storms. Illinois-based Exelon Corp said its Baltimore Gas & Electric (BG&E) unit in Maryland had about 170,000 customers out, down from about 600,000 homes and businesses affected. Virginia power company Dominion Resources Inc said it still had more than 170,000 customers without electricity in its Virginia and North Carolina service areas. Washington, D.C.-based Pepco Holdings Inc said it had more than 116,000 customers without power in the District of Columbia and Maryland and more than 69,000 out in New Jersey.